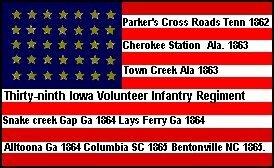 National flag, Thirty-ninth infantry; Parker's Cross Roads, Tenn., 1862; Cherokee Station, Ala., 1863; Town Creek, Ala., 1863; Snake Creek Gap, Ga., 1864; Lay's Ferry, Ga., 1864; Alltoona, Ga., 1864; Columbia, S. C., 1865; Bentonville, N.C., 1865. National flag, Thirty-ninth infantry; turned over by Col. J. M. Griffith, August, 1894. Banner, Thirty-ninth infantry; turned over by Col. J. M. Griffith, August, 1894. SOME OF THE THIRTY- NINTH IOWA INFANTRY HISTORY !!! THE THIRTY-NINTH INFANTRY Companies and Officers, are as follow.. H.J.B. Cummings, of Winterset,Iowa as Colonel; James Redfield, of Redfield,Iowa as Lieutenant Colonel; and J.M. Griffiths, of Des Moines,Iowa as Major. Companies A and F were from Madison County; Companies B and I, from Polk County; Companies C and H, from Dallas County; Company D, from Clark County; Company E, from Greene County; Company G, from Des Moines and Henry Counties; Company K, from Clark and Decatur Counties. Was engaged at Parker's Cross Roads, Tenn.; Corinth, Alltoona, Ga.; Resaca, Kenesaw Mountain, Atlanta, Sherman's march to Savannah and through the Carolinas to Richmond, and was mustered out at Washington June 5, 1865. Nine of the companies went into camp near Des Moines in September, 1862, and began drill, but the regiment was not organized until November. H. J. B. Cummings was commissioned colonel; James Redfield, lieutenant-colonel; Joseph M. Griffiths, major, and George C. Tichenor, adjutant. On the 13th of December the regiment started for the south, stopping for a few days at Cairo, Columbus and at Jackson, Tennessee, marching from there to Trenton. Here two brigades were organized to move against General Forrest. Colonel C. L. Dunham of the Fiftieth Indiana commanded the Union forces which included the Thirty-ninth Iowa. On the 27th of December he marched eastward with 1,600 men and on the fourth day came suddenly upon Forrest's army 6,000 strong, drawn up in battle array at Parker's Cross Roads, a few miles south of Clarksville. The battle at once began and was carried on with varying success for several hours, the little Union army holding its position with great bravery until General Sullivan came up with heavy reenforcements, when the Confederates were routed. The Thirty-ninth was under heavy fire for several hours and fought bravely. Misapprehending an order at one stage of the battle, the regiment was temporarily thrown into confusion but soon rallied and regained its place in the line. Lieutenant-Colonel Redfield and Captain Cameron, Major Griffiths and Adjutant Tichenor were conspicuous for gallantry. The loss of the regiment was four killed, thirty-three wounded and eleven missing. Among the wounded were Lieutenant-Colonel Redfield, Major Griffiths, Captain Brown and Lieutenant Rawles. On the 29th about one hundred men of the regiment, worn out on the march in attempting to return to Trenton, were captured at Shady Grove and suffered an imprisonment of nearly ten months. In January, 1863, the regiment moved to Corinth and was there assigned to the Third Brigade in the division commanded by General G. M. Dodge of Iowa. Headquarters were in Corinth for nearly a year, with an occasional march into the adjacent country. The regiment was with Colonel Streight in his raid into Alabama, returning to Corinth. Company H in April being sent a few miles from Corinth to guard a corral, was surrounded by several hundred of the enemy's cavalry, the captain and most of his men captured. During the remainder of the year the regiment was employed in Tennessee guarding lines of railroad and similar duties. In the spring of 1864, the Thirty-ninth joined Sherman's army at Gordon's Mills, and from this time until it reached Livingston our regiment marched and fought on the right wing. It led the army in the flanking movement by Calhoun, which caused the evacuation of Resaca by the Confederates. Here it was engaged with superior numbers and was extricated from a position of great peril by the arrival of reenforcements. The regiment remained at Rome doing garrison duty until October when, joining the forces under General John M. Corse, it participated in the BRILLIANT DEFENSE OF ALLATOONA General Hood in command of the Confederate army was now moving northward and sent a force of cavalry to cut Sherman's communication near Marietta, while with the main army he crossed the Chattahoochee and marched on Dallas. A large force of the enemy, after destroying the railroad at Big Shanty, moved against Allatoona Pass, where there were immense stores of rations for Sherman's army guarded by the Ninety-third Illinois under Lieutenant-Colonel Tourtelotte. general John M. Corse was at Rome with his division. General Sherman signaled him to reinforce Allatoona Pass and hold it at all hazards. Early on the morning of October 5th Corse was there with 2,000 men, including the Thirty-ninth Iowa under Lieutenant-Colonel Redfield. Soon after daylight General French had the works completely invested and sent Corse a summons to surrender, which was promptly declined. An assault was then ordered and the Confederate army rushed upon the outer works with the utmost fury. A deadly fire was opened upon them by the garrison making great gaps in their lines which were promptly filled, and one of the most deadly combats of the war ensued. The enemy charged by regiments and brigades and the struggle over the rifle pits and outer works was of the most desperate character. Corse signaled back his grim reply and the battle increased in fury. Having failed to break our lines by repeated charges of brigades the Confederates now came on in mass. Wrought up to the highest pitch of desperation on both sides the combat became of the most deadly nature. Men bayoneted each other over the rifle pits and officers thrust their swords into the bodies of their foes. Corse received a severe wound in his face and became insensible, when Colonel Rowell of the Seventh Illinois assumed command and directed the battle with skill and courage until he, too, fell severely wounded. Corse having revived, now resumed command and the garrison was driven into two forts. At two o'clock the crisis of the hard-fought battle came. The garrison was weakened by long hours of the most desperate fighting and the loss of many brave men, but there was no thought of surrender. The Confederates now formed in compact masses for another assault. Our gunners double-shotted their field pieces and waited until the enemy was within a few paces, then opened upon the crowded ranks with grape and canister. Nothing could stand against the deadly missiles; staggered and confused they halted, then broke and finally turned and fled. The great victory was won but at a fearful cost. More than seven hundred of the brave defenders fell in the heroic struggle. No regiment at Allatoona Pass fought with greater gallantry than the Thirty-ninth Iowa. In the early part of the battle it was posted some three hundred yards from the principal forts which had been constructed for the defense of the place. Here the enemy made the most determined attacks which were several times repulsed. At length the regiment fell slowly back to cover of the forts, where it fought with courage and obstinacy never surpassed. The losses in killed, wounded and captured were one hundred and sixty-five and among the slain was the heroic commander, Lieutenant-Colonel James Redfield. He was first wounded in the foot but retained his command; a second shot shattered his leg but he still refused to leave his post, and directed the fight encouraging his men by example and words to hold their ground. A third ball pierced his heart and Iowa lost one of its noblest and bravest officers. Lieutenants O. a. Ayers, A. T. Blodgett, N. P. Wright and J. P. Jones were also killed and O. D. Russell was severely wounded. The Thirty-ninth was in the division with Corse in Sherman's march to Savannah and participated in that wonderful campaign to the end. It was in the grand review at Washington at the close of the war and was mustered out of the service in that city on the 5th of June, 1865. 39th Regiment Infantry Organized at Des Moines and Davenport and mustered in November 24, 1862. Moved to Cairo, Ill., December 12-14; thence to Columbus, Ky., December 16. Attached to 3rd Brigade, District of Corinth, 17th Army Corps, Dept. of Tennessee, to January, 1863. 3rd Brigade, District of Corinth, 16th Army Corps, to March, 1863. 3rd Brigade, 2nd Division, 16th Army Corps, to September, 1864. 3rd Brigade, 4th Division, 15th Army Corps, to August, 1865. SERVICE-39th IOWA INFANTRY(( 1862 FROM IOWA - TO WASHINGTON D.C. 1865 )) SERVICE.Organized at Des Moines (( 1 ))and Davenport (( 2 )) and mustered in November 24, 1862. Moved to Cairo, Ill (( 3 )). Defense of Jackson, Tenn (( 4 ))., and pursuit of Forest December 18, 1862, to January 3, 1863. Parker's Cross Roads (( 5 )) December 30-31, 1862. Moved to Corinth, Miss (( 6 )). January 6, 1863, and duty there until November, 1863. Dodge's Expedition into Northern Alabama April 15-May 8. Great Bear Creek and Cherokee Station April 17. Tuscumbia April 22-23. Town Creek April 28. March to Pulaski, Tenn (( 7 )). November 2-12, Guard duty at Reynolds Station and along railroad until January 21, 1864, and at Pulaski until March 12. Moved to Athens, Ala (( 8 )). March 12, and to Chattanooga, Tenn., April 30. Atlanta (Ga.) Campaign May 1 to September 8. Demonstration on Resaca May 8-13 (( 9 )). Snake Creek Gap and Sugar Valley May 9-10. Battle of Resaca (( 10 )) May 13-14. Ley's Ferry, Oostenaula River, May 14-15. Rome Cross Roads May 16. Kingston May 19. Moved to Rome (( 11 )) May 22 and duty there until August 15. Expeditions after Wheeler August 15-September 16. Moved to Allatoona October 4. Battle of Allatoona (( 12 )) October 5. Moved to Rome October 9. Reconnaissance and skirmishes on Gave Springs Road October 12-13. Etowah River October 13. March to the sea November 15-December 10. Ogeechee Canal December 9. Siege of Savannah (( 13 )) December 10-21. Campaign of the Carolinas January to April, 1865. Salkehatchie Swamps, S.C. February 3-5. South Edisto River February 9. North Edisto River February 12-13. Columbia (( 14 )) February 15-17. Lynch's Creek February 25-26. Battle of Bentonville N. C (( 15 )). March 20-21. Occupation of Goldsboro March 24 Advance on Raleigh (( 16 )) April 9-13. Occupation of Raleigh April 14. Bennett's House April 26. Surrender of Johnston and his army. March to Washington, D.C. (( 17 )) via Richmond, Va., April 29-May 30. Grand Review May 24. Moved to Louisville, Ky., June. Mustered out August 2, 1865. Regiment lost during service 6 Officers and 58 Enlisted men killed and mortally wounded and 2 Officers and 134 Enlisted men by disease. Total 200. BILLY YANKS AT A REENACTMENT!!! HEADQUARTERS THIRTY-NINTH IOWA INFANTRY, Battle Ground, Parker's Cross. Roads, December 31, 1862. LIEUTENANT: I have the honor to submit the following report of the part taken by my regiment in the battle of Parker's Cross-Roads this day: Upon arriving at the cross-roads we were halted, and remained in that position some time, while the Fiftieth Indiana Infantry, deployed as skirmishers and supported by two pieces of artillery, engaged the rebels upon the hill to the right and west of the road. We were then ordered to file to the right, up the lane, to take position in the woods upon the hills, and upon arriving there I was ordered to countermarch and take position about a mile south of the cross-roads, and there formed in front of a few log houses, upon the left of the One hundred and twenty-second Illinois Infantry. About 11 a.m. I changed front forward on first company and moved north about a quarter of a mile, and again formed on the left of the One hundred and twenty-second Illinois behind a fence. Here we were exposed to a murderous fire from two pieces of the enemy's artillery in front and a battery of about six guns upon our right, which enfiladed my entire line; we were also exposed to a heavy musketry fire from the enemy's dismounted cavalry. My men were in a low skirt of timber, but returned for a long time, with much energy, the fire from their rifles. Notwithstanding the grape, canister, and shell of the enemy were falling thick upon them, wounding many, they behaved admirably and fought with much coolness; and here allow me to remark that they were greatly encouraged by the presence of Colonel Dunham, commanding the brigade, who, amid the thickest of the iron hail, rode in front and rear of them, urging them to do or die for their country. After fighting for an hour or more in this position some officer came down to my right and gave an order, which several of my officers say to me was "Rally to the rear." Had the officer passed down as far as my colors he would have found me, and I am satisfied I could have had my command heard my voice; have about-faced the regiment, and led them anywhere without confusion; but, being raw troops and imperfectly drilled, they mistook the command for an order to retreat and commenced breaking to the rear from near the right of the regiment, which, despite my efforts, became propagated along the whole line. I hastened toward the right of the retreating men and ordered a halt and the command to form, and had done much toward reforming when we were opened upon by a heavy fire of dismounted men, who had advanced under cover of the thick underbrush to within 50 feet of my men. They then in more confusion fell back toward the fence, and received standing the fire of the enemy's artillery, and under it and the fire from the rear the confusion became worse. Companies F and D, and several from other companies, formed upon the now right of the One hundred and twenty-second Illinois, which had faced to the rear, and assisted them in driving the rebels back at the point of the bayonet, taking a number of prisoners. Under this fire, so unexpected from both front and rear (and the enemy's cannon seemed to be entirely concentrated upon our left, to save their own force in our rear), about half of my regiment broke to the left of our line as formed behind the fence and crossed the road into the corn-field upon the opposite side. Assisted by Colonel Dunham, Lieutenant-Colonel Redfield, who was severely wounded; Major Griffiths, who had been struck on the head by a spent grape-shot, and yourself, I attempted to halt and reform the scattered men. The enemy turned their cannon upon us and we were fired upon by their cavalry, and I was unable to form a line until we reached a skirt of timber about a quarter of a mile from where we laid in line. Here I formed and marched back upon the left again of the One hundred and twenty-second Illinois. Let me say that in this confusion we found a number of the One hundred and twenty-second Illinois and of the Fiftieth Indiana, but they fell in with us and marched back to the battle ground. Shortly afterward, perhaps half an hour, and at about 1.30, re-enforcements arrived and the battle ended. I have omitted to state that at the cross-roads Company A was detached from the regiment and guarded our trains. When we fell back to the ground on which the battle was fought, they, or rather all but 15 of them, with Company G, of the One hundred and twenty-second Illinois, were stationed at the house in the rear of our line of battle. Here they three times repulsed a regiment of cavalry who attempted to force their way through the lane to reach our main body. The 15 spoken of were near the trains, and there succeeded in capturing over 40 of the rebels. There were many cases of individual bravery among those under my command; but to particularize would make my report too lengthy. I must, however, say that, from information received through reliable men of my command who were taken prisoners and paroled, I am satisfied that the rebels had men dressed in our uniform so close in our roar that they could see our exact position--knew the numbers of our regiment and strength. Allow me to add that while I cannot take the room to name the many of my company officers who did their whole duty, I must bear witness to the coolness and bravery of Lieutenant-Colonel Redfield (who ceased his labors only when his wound compelled him), Major Griffiths, Surgeon Woods, and Adjutant Tichenor. They rendered me all the assistance possible. The following figures show the number of my officers and men that took part in the engagement: Field and staff. 5 Company officers 21 Enlisted men 379 Total 405 My report of casualties is as follows: Killed 3 Wounded 33 Missing 11 Total loss 47 Company C, with the exception of 5 men, were left on picket at Huntingdon, and did not arrive in time to take part in the engagement. I am, very respectfully, your obedient servant, H. J. B. CUMMINGS, Colonel, Commanding. Lieut. JOHN R. SIMPSON, Acting Assistant Adjutant-General, Second Brigade. CLICK HERE TO MARCH BACK TO THE 39th IOWA's PAGE! THIS PAGE WAS DESIGNED BY CAPTJOJO 39THIA INF. by Capt JoJo Leto 39th Ia Infantry. 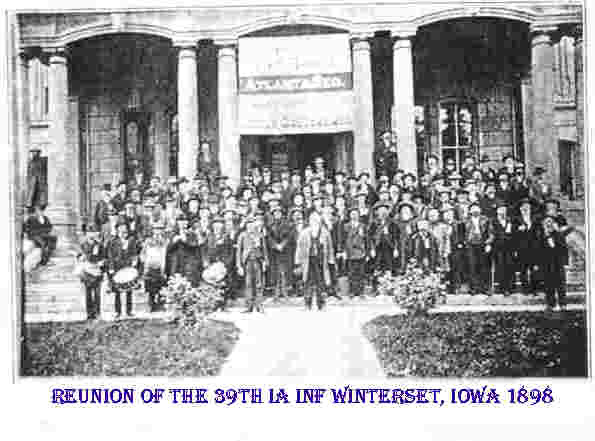 Want to join the 39th Ia Inf?